Shirley and, husband, Bob, investigate the Kitaro Nyohyo Tamada letters! I became interested in these letters as they could give us insight as to how the Issei felt about playing Japanese music in camp. All of the Issei are gone now, which gives more importance to these letters. After some digging, I was able to contact a representative at the Henry Cowell Foundation. The representative there advised me that she could give me permission to obtain copies of the letters if I did “due diligence” in trying to locate the heirs of Mr. Tamada. First, I went to Kayoko Wakita, a koto teacher we interviewed in the film, whose father was also a shakuhachi teacher, and a friend of Mr. Tamada. I asked her if she remembered anything about him. She said that he was a nice man, maybe a little eccentric. He never married, and had no children. Then, I checked Ancestry.com, as they had recently partnered with the National Archives, and have housed much of the information and records about the camps from the War Relocation Authority, the governing entity of the camps during WWII. 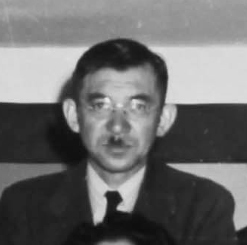 I found out some information about Mr. Tamada: he was born in 1894 in Japan, came to the U.S. in 1914; during WWII, he was incarcerated at Manzanar camp. 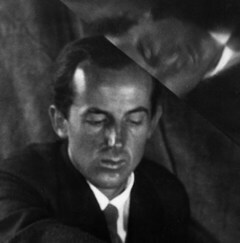 He died in 1969 in Los Angeles at the age of 74. I thought we had hit a dead-end here. Then, my husband, Bob, decided to research the Los Angeles County Recorder’s Office, to see if we might find a copy of Mr. Tamada’s death certificate. During a trip to Los Angeles, Bob and I took the opportunity to visit the LA County Recorder’s Office in Norwalk . A clerk looked through the microfiche records, and found Mr. Tamada’s death certificate. We found that the Fukui Mortuary had taken care of Mr. Tamada’s final wishes. I checked online, and found the Fukui Mortuary was still in business! They still had information from 1969: two of Mr. Tamada’s friends’ names and contacts who took care of everything were listed. We were advised of the name and address where Mr. Tamada’s ashes had been sent to, to a relative in Aomori, Japan. Amazingly, the very next day, Shigeo contacted me, and said he had located a nephew of Mr. Tamada!! So, now he was in contact with Mr. Tamada’s family. Shigeo was able to obtain 4 signatures from Mr. Tamada’s family members, and, of course, they would like to see the DVD when it is completed. I went back to the representative at the Henry Cowell Foundation with this news, and was able to obtain permission to request the copies of the letters from Mr. Tamada to Mr. Cowell, which dated from 1932 to 1962, so they had quite a long relationship. 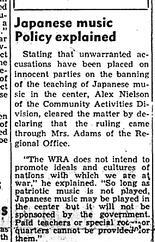 Strangely, there were no letters in the collection from Mr. Cowell to Mr. Tamada to be found during his time at Manzanar, although Mr. Tamada’s letters, he thanked Mr. Cowell for writing to him, and even sent him music supplies he requested while in camp. Another wonderful thing happened with this story: I thought it would be a long-shot to ask George Takei to read the Tamada letters in the film. I wrote to Brad Takei to see if we could ask George to read these letters. Brad replied that George would be happy to do this for us, but because they are extremely busy trying to get their musical about the camps, entitled “Allegiance”, on Broadway in New York, they were not often in Los Angeles. Brad said they would be able to do this next week, and could we come then? I said, “Yes! !”, and made arrangements to drive from the Bay Area to L.A., driving down in the evening, and back the next day. While we were there, George and Brad were very gracious, helped us in every way. I have always admired George’s work, not only from his acting work (I love the original Star Trek series! ), and beyond, but also for his tireless work in the Japanese American community and for human rights. I’ve read both his books, “Oh Myyy…” and “To the Stars”, which he very kindly autographed for me. I was so afraid to ask for a photo of him with me, that I just didn’t, so I have no visual proof we actually met him! But it was still a real treat to actually meet him, and hear that deep, wonderful voice in person! I have been wanting to write to you for a long time but somehow there is always so much to do and also I am a bad correspondent, as you know. I thank you very much for your nice letter and so glad to hear from you that you are very well. Your letter make me so joy and happy all day today. I often too thinking of you and try to write something. I am glad to hear about Alice who are now studying for music at Oberlin from out the relocation enter. I suppose how her parents happy to get so nice school and study for. Now, may I ask you again to buy to me, I want a tune pipe for to use a koto player. My friend koto teacher wants it. But I do not know tune pipe number, so get me it, your judgment from your music store. Scale is D (international pitch) or F or E? I want good one. I thought you may interest how few persons felt about our music. I am still teaching shakuhachi at night and keeping well! In anytime, I am working so hard to dig up old concrete pipes from ground with fifteen crews on the Farm. We get $16.00 a month. Thank you for the string for the koto. That is very good to suitable as good as other, I think, and my friend are using every day to play with it. But I think the price of string is higher (18ft. length of gut @ $2.50. 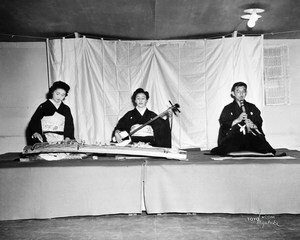 For the koto instrument, we need “seven” 18 ft. length of gut; that cost about $17.50. My friend has payed for bill when I get a strings. I do not expect to pay by you. Thank you for your trouble.